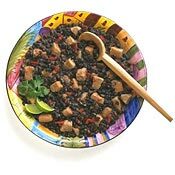 RECIPE TITLE "Cuban Black Beans with Pork Recipe"
Turn this hearty bean stew into a vegetarian dish by omitting the pork and sauteing the vegetables in the oil. Serve the stew with a green salad with red (Spanish) onion and orange slices for a colourful Latin-flavoured meal. In the same pan combine beans and remaining 2 qt fresh water. Bring to boiling; reduce heat. Cover and simmer for 1-1 1/2 hours, or 'til beans are tender, stirring occasionally. Meanwhile, in a deep 12 in. frying pan, heat 1 tablespoon of the oil. Brown half the pork in hot oil on all sides; remove from pan with a slotted spoon. Brown the other half of the pork, adding more oil if necessary. In the same pan cook onion, pepper, and garlic for 3 minutes. Drain off excess oil. Return pork to pan. Add the 12 fl oz water, the salt, cumin, crushed dried chilies, and pepper. Bring to boiling; reduce heat. Cover and simmer for about 1 hour, or till meat is very tender. Drain beans and mash slightly; stir into pork mixture. Cook about 5 minutes more, or till slightly thickened, stirring occasionally.